The Family Cheese LP | The Family Cheese | OK Listen! 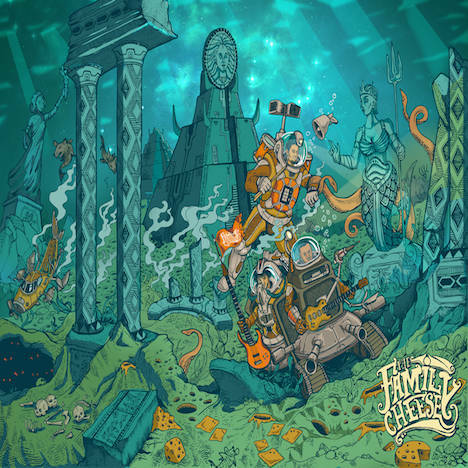 The Family Cheese's debut album is a collection of eight songs in eight different styles, a strong move away from the era of singles and three minute radio hits as the the entire music industry moves towards the future of the Information Age. The albums starts with a rap song about the life of a teenage Parsi boy just trying to find some alone time with his Non-Parsi girlfriend before chaos ensues. Then, the band takes the listener through a flight and crash in space in the eight minute Carnatic opus B.O.O.B before the narrative returns to our Parsi boy looking in the mirror and writing a song about the different mind space we all share in U.N.I.R. This album is a collection of songs written over years of travelling the breath of the country, from Gujarat to Nagaland and from Delhi to Puducherry as they started out their journey as a young band. They speak of childhood fantasies turning into mundane realities we try and comprehend alone, before reaching out to friends and society around us. They have soundscapes, cinematic scores to imaginary journeys and the very real experience of a chaotic auto ride with an even crazier auto driver. The Family Cheese LP is the record of three young minds growing into their instruments and their songs growing with them; three minds that cannot help but be inspired by the world around them. The shared human expeirence through a prism of constantly changing perspective, changing only through the ears of the listener one at a time. No show is ever the same as the mad jamming and improvisational performances can go anywhere and everywhere!